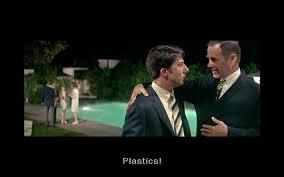 “I have one word for you… Plastics!” In this scene from The Graduate , Dustin Hoffman’s character, Benjamin Braddock, is being advised to start his career in the plastics industry. Clearly from Benjamin’s body language, he has absolutely no interest in working in the plastics industry! I have one word for you, Plastics! You will be more successful in your career by developing a Company Search Strategy that identifies industries and companies that fits your values, passions and work style. Without strong culture fit, you risk being unhappy and leaving a position too early. You won’t have reached your full potential at the company. And you will need to explain the early exit in your next round of interviews. So, how do you do develop a Company Search Strategy? First assess your preferences. Then do some market research. Build your strategy with a combination of self-assessment, reflection and market research. Which Industry Sector Do You Admire? What societal issues do you care about? Which industries don’t you respect? What specific industries do you admire? Which Companies Are In Your Company Search Strategy? Market research is very critical. Most people only consider known brand name companies. That significantly limits your opportunities. Who are the top companies in this industry? Do you prefer large or small companies? And why? Do you prefer established companies or emerging start-ups? How long will you commute? What Corporate Cultures Resonate with your values? Answer this question before you start interviewing. Otherwise once a company invites you for an interview, it will be hard for you to recognize culture fit red flags. Those rose-colored glasses are really hard to take off! With answers to these questions, you now have a set of guiding principles to focus your job search and offer decision criteria.